25 Stunning Updos for Medium Hair You Gotta Try! Most women opt to have medium length hair. There are different reasons why we prefer having this length than model like long locks or daring bobs. But this certain size of hair is no exemption for stylish updos. These hairstyles for medium hair are quick, easy, and brighten up any face shape. Here are 25 ideas to vamp up your hair for any occasion. 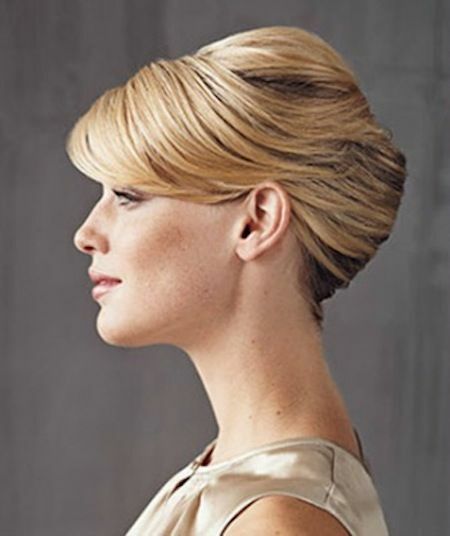 Just like Reese Whiterspoon who can pull off any style, this simple hair style never lost its touch. Whatever your hair color, this perennial trend will compliment any outfit and occasion. It won’t be called classic if it was otherwise. 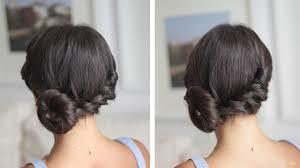 This is also called the 2 Minute Updo because it really takes only 2 minutes to create this hairstyle. All you do is form your hair into a ponytail and on the third or last round of inserting the hair, turn the bunch around. Then part the hair just above the crown of the ponytail, sort of creating a hole and pull the ends then the rest of the bundled hair through. You can also see the actual steps here: Easy Everyday Updo. You can wear this style in school, at the office, or for a dinner date. Easy and simple. Yes. 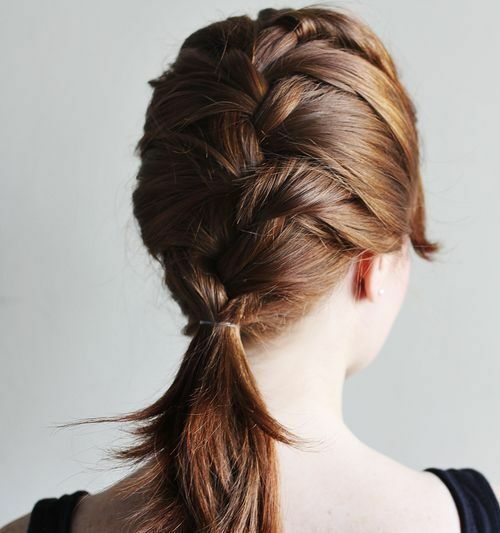 Another continuing style called French Braid does well with medium length hairs. This style has been passed down from our grandmothers, which qualifies it as a historical hair trend. It’s very easy to French braid…of course, it involves a lot of practice and patience. But the payoff is worth it. This hair style will definitely live on. 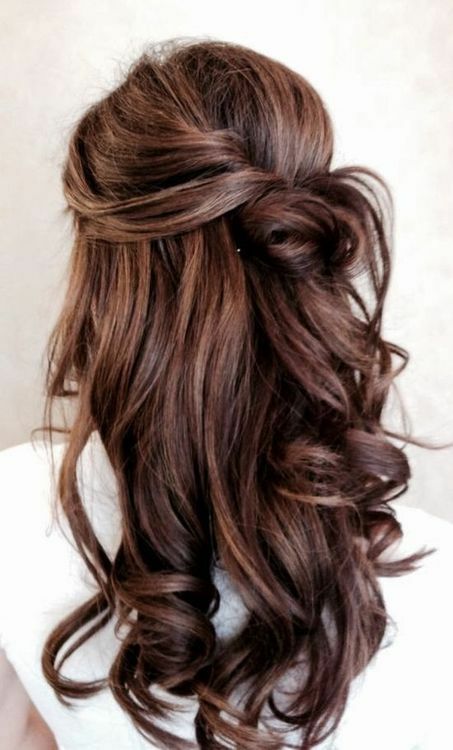 This is another classic updo for medium hair! 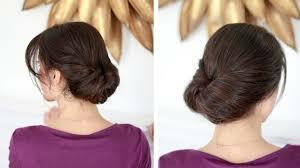 If you prefer your locks loose yet not in your face’s way, you can opt for the half updo. Always a winner when it comes to weddings and proms or if you just really like simple but pretty style. You can add extra oomph by curling your hair just like what this girl did. The fishtail braid has made its debut a few years ago. We’ve seen it on runways and movies. A lot have been intrigued by it. Thanks to Youtube tutorials it has been a breeze to learn this complicated looking style. With that, even young girls can wear this to school. Don’t feel like a mermaid to wear the fishtail? 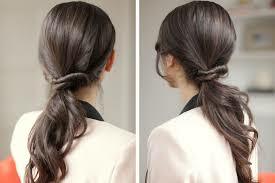 If yo’re looking for simple updos for medium length hair, here is the older sister called the side braid. Braiding has been a pastime for young girls and we’ve brought that skill as we’ve grown. So recreating this hairstyle is easy-peasy. Look at Miranda Kerr. No matter how simple the style is she still rocks. And we know that you would too. This style is so simple and classy. All you have to do is part a section of hair and separate it from the rest of your hair. 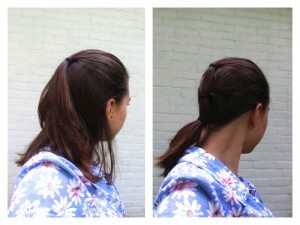 Tie the latter in a low ponytail. Then start twisting the segregated section from the side and start wrapping it around the ponytail. When you’ve covered the ponytail, pin the twisted hair in place. It is really fast and simple yet you will get compliments for sure. 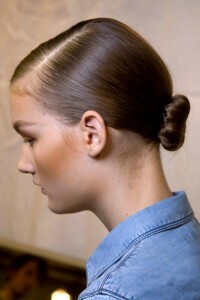 Since we are working on an average length of hair, wearing your bun low would be the sensible choice. You have 2 ways to play with this look. One is wearing it with a parted hair like in the photo. Another play is wearing the bun on the side. Whichever way or side, this style is a staple. In creating this hairstyle, you usually need a tool that pulls your ponytail through resulting in an inverted or backward pony. But the simplest way is to just create a hole just above the crown of the ponytail and rolling the ponytail inside and pulling the ends all the way through. And viola! There is your loop-through hairstyle. In this photo it shows how it works well with slightly shorter medium length hair. Another style to keep in your catalogue. If you need to step out for a quick grocery or you just feel like not putting much effort in with your hair but still want to look good, the messy bun is your go to style. It is as simple as combing your hair with your fingers, pulling your hair up or side and just twist and tie loosely. You will still look effortlessly glamorous. Just look at Jennifer Lawrence donning the messy bun in a red carpet event. This hairstyle goes well for the hot and cold season. Why? Well, if you feel cold, you can just pull the lower portion and it still gives you a half updo. While if you’re strolling on a hot summer day, grab the rest of the hair and tie it together with the half updo in a low ponytail. In this photo, the model has 3 layers but you can use just 2: A half pony and a low ponytail. This goes well too with an edgy attire. 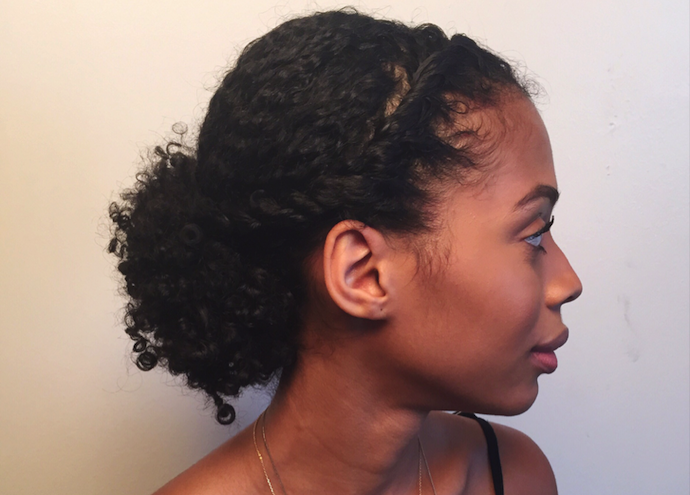 This one is a super easy updo for medium hair! There’s the half updo, and now the half bun. Surprisingly, men have been carrying this style as well calling it the Man Bun. What else can we say about this hairstyle? It’s a gamechanger. If men can look good with it, so can women. And if you’re the spirited type, then girl this is your style. Get your half bun up and rock it. Want to feel the 80s vibe? Try this for size. Set your hair high on whichever side you prefer and secure the pony with a colorful ribbon or even a scrunchie. This style is also perfect for those who exercise and jog. You may break a lot of sweat but you’d still look awesome while you’re at it. If you have bangs, you know how sometimes it just gets in the way of almost everything we do. So this go to hairstyle is the best. Just pull your bangs back and secure with a bobby pin or two. Tip though, hair pins are slightly loose and tend to slide so your best accessory here is a bobby pin. They have a tight grip and will secure you bangs neatly in place. 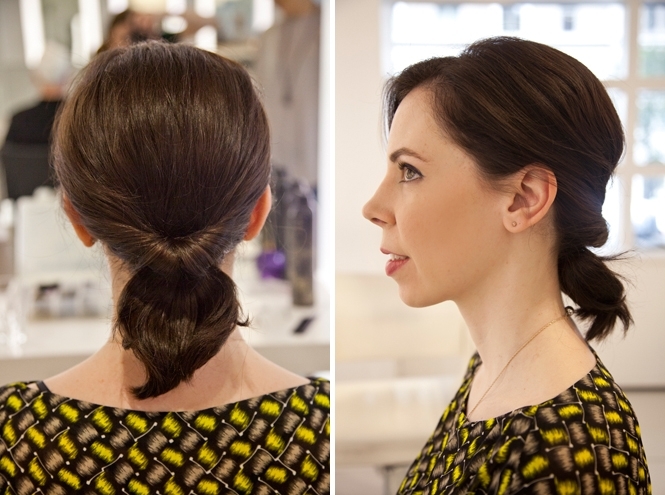 This elegant and gorgeous hairstyle is one way to up the classic chignon. Many women who attend weddings wear this style. 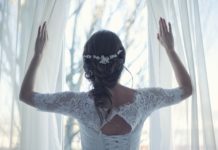 It makes the wearer bloom, whether it is the bride or the bridesmaids. Certainly this hairstyle is not to miss on such special occasions. Roll that hair girl. Do you want a different take on the basic braid and side bun? Here we have what the stylist calls Traintrack Braid. You can wear this on special occasions or while hanging out on the beach with friends. 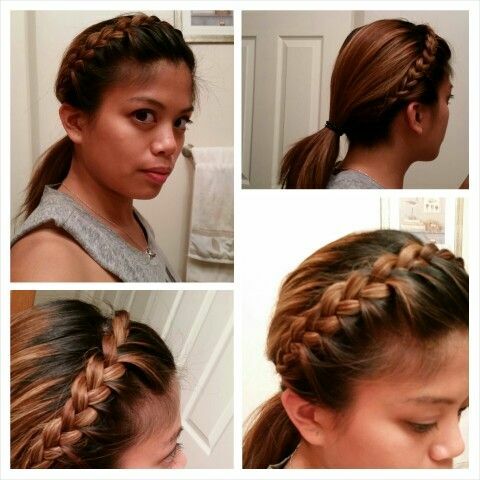 It might even turn into a braiding party as your friends will definitely ask you to braid their hair just like this. If you want your bangs to stand out then you have to give this look a try. Medium hair is long enough to create a high bun. When you happen to have fringes, you will undeniably get attention with this dramatic style. Did you notice this look has so much going on? Well that is why this is the perfect style for layered shoulder length hair. First you braid a section of hair to the side and then gather all the hair into a high pony tail. 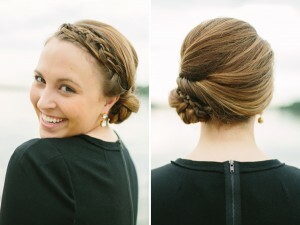 Lastly, grab a couple of long strands from the ponytail and wrap it around the crown and secure with bobby pins. And there you’ll have a multiple style updo. For those days you want to dress up your hair, this look is the best to wear. It may look tiresome but this style only takes less than 5 minutes to create. You just need to twist a section on hair and keep adding the rest of the hair. When you get to the side, wrap it with a ribbon. Make sure also to secure the bun with hair pins. Yes, hair pins this time as you are pinning a bulk of hair. Give it a try for dress up school or office days. 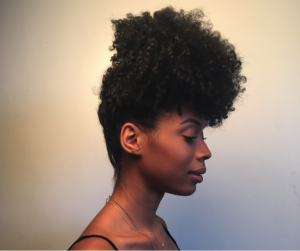 For ladies who have natural curly hair, here is a style that will be a breeze to create. With your natural curls, wearing this style will also have natural volumes. This is definitely a beautiful look to use from night out with friends. Yes, you read it right. Since your hair is obviously curly, for sure it will be fun to wear this groovy style. Perfect for a night out dancing or partying in the club. You’ll certainly grab a lot of attention. Wear your hair proud sister. 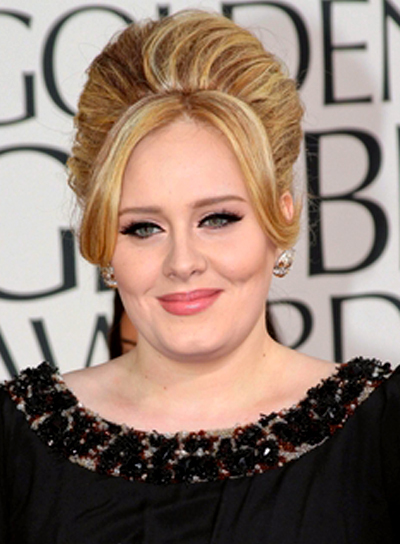 Adele fans listen up! Even if you have medium size hair, you can wear it like the singer. This involves a lot of teasing and hairspray though. But it’s worth it. That beehive like hair also won our hearts so we dare know that you will win hearts with this trendy look. Sing and wear it like Adele ladies. Here is another variation of the teased updo. If you are more of the free-spirited lady then you can wear this look. The difference here is the parting of the hair is deeper. If you have layers then this is pretty awesome. Just see Lily Collins. Doesn’t she look striking with this style? If she can wear it beautifully, we know you ladies would look equally stunning. 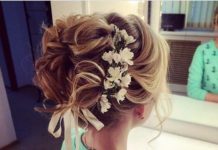 You will see this updo worn by girls of all ages. This is one timeless look. 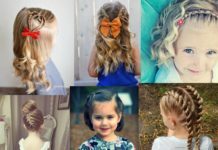 Mothers love braiding their daughters’ hair like this to keep them looking neat. Young ladies don this to show their pretty faces. Women wear this updo for formal events. The French braid headband ponytail is eternally a staple for all ages. The French twist is an updo all women with medium length hair must always have in their collection. This is the ultimate in hair updos and women with all types of hair can wear it. With all different types of hair, this look will have different flavors to it. Wear it on simple days, weddings, prom, movies, dates, dinners, and even picnic in the countryside. It’s very much appropriate on balls and formal dinners. 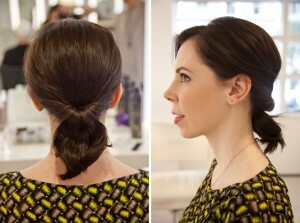 The French Twist is absolutely the belle of the ball in updos. We hope you’ve found some inspiration from our list of Updo hairstyles for medium length hair!